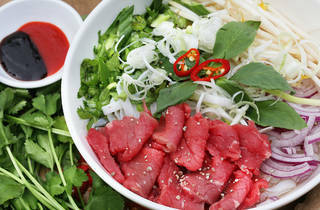 Vietnamese street food operation gone permanent. There are things everyone misses when they move out of east London. For some, it’s the warehouse parties or the canalside strolls. For me, waving farewell to the East End left a hole in my heart the size and shape of Kingsland Road’s many Vietnamese restaurants, which as you can imagine is a fair burden on the old circulatory system. 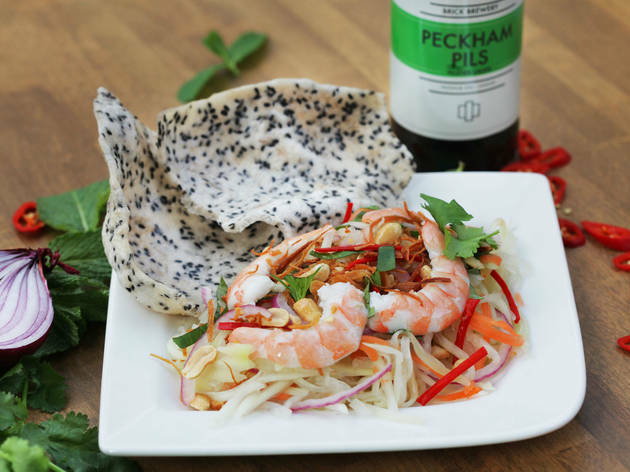 For rent-hike refugees who’ve ended up in Peckham, though, things are looking up, as former Bussey Building regulars Banh Banh have just joined the burgeoning food village at the tip of Peckham Rye. 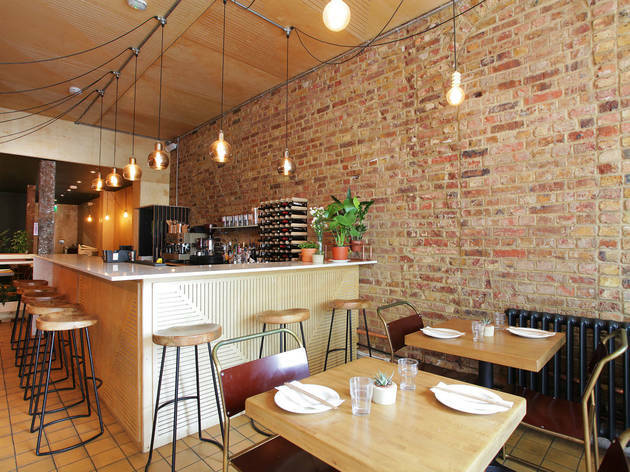 Housed within a neutrally decorated, plywood-clad space, the restaurant is run by five siblings of the Nguyen family, who have based their menu on recipes left behind by their grandmother, who worked as a chef in Saigon in the 1940s. Granny Nguyen was clearly a bit of a trailblazer. 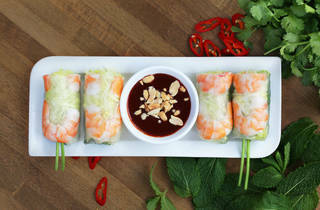 As well as the classic Vietnamese dishes you’d expect, (summer rolls, pho, noodle salad) there are plenty that you may not, such as the house special banh khot pancakes – gob-sized eggy hemispheres filled with juicy prawns and topped with spring onion, served still-cooking in a cast-iron skillet, with leaves and dipping sauce on the side. Like everything else on the menu, these come in at less than a tenner. 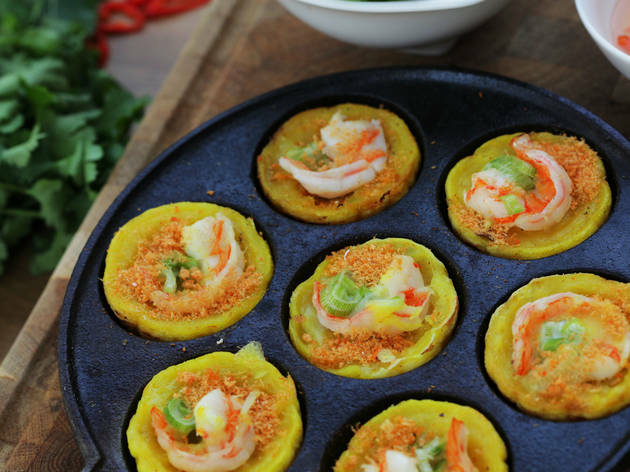 Dishes may be designed for sharing, but most of the larger options will do the trick on their own, making Banh Banh just as great an option for a quick solo lunch as it is a communal blow-out with mates. 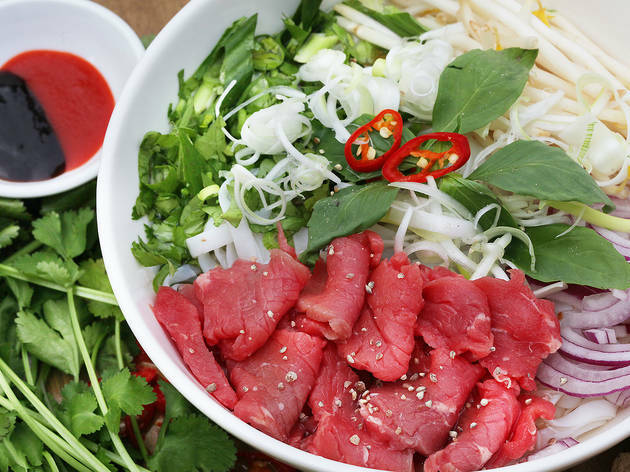 Should you opt for the latter, here’s my advice – gather up a few dyed-in-the-wool Hackney types, order one of everything and watch their faces as they clash chopsticks over some of the best Vietnamese food in the city. 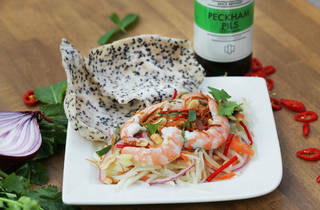 Lovely little Vietnamese restaurant based in Peckham Rhy. The waitress was very friendly and helpful, my friend and I were spoilt for choice with the menu and she helped up choose a few dishes to share, her recommendations were spot on, I loved every dish. We had the chicken wings which were crispy and succulent, the coconut prawn pancakes which were something I have never had before, so unusual and the Vietnamese bowl which consisted of noodles, veg, crispy spring rolls and beef patties. Highly recommend all 3 dishes! 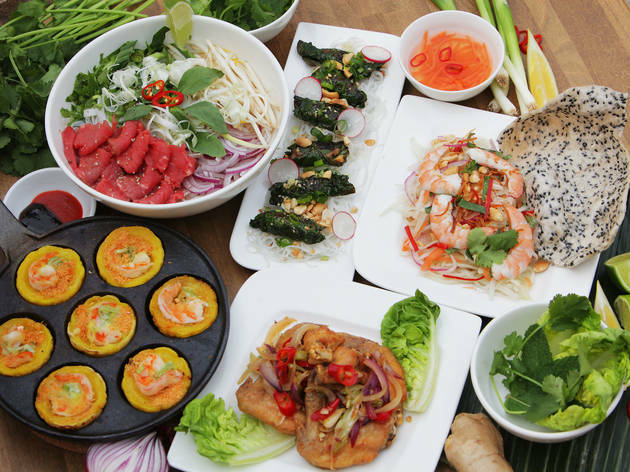 I am really into Vietnamese food at the moment and I would have to say this could be one of my favourite places to go, the food is made from fresh and seasonal ingredients and it's really reasonably priced! 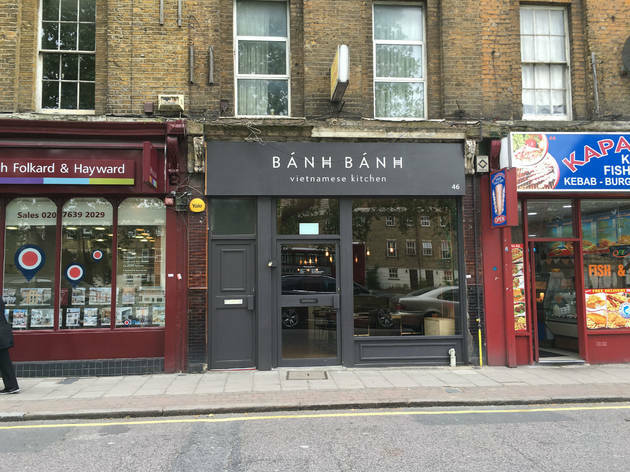 I went to the soft launch of Banh Banh but I'm pleased to say standards have vastly improved since then. Staff were attentive and knew the menu well. The food was enjoyable, chicken wings seasoned well with crispy skin, aubergines were tasty and I liked getting hands on with the banh khot pancakes - wrapping them in salad and herbs then dipping into the homemade nuoc cham sauce before gorging. There were plenty of vegetarian options, but they also went out of their way to accommodate and amend a couple of dishes so they were veggie friendly for the whole party to enjoy. We were stuffed after the main course, but was sold after hearing of the freshly made soft centred meringue, drizzled with mango. It was light and the perfect way to end the meal. Wheelchair access: step free entrance into the dining area, but no accessible toilets. Great Vietnamese food in a buzzy little restaurant. We ordered a few of the smaller plates to share; the chicken wings and aubergine were especially good. 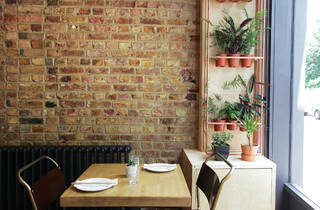 As with most of Peckham's restaurants it can be hard to get a walk in table - it’s worth booking on the weekend. 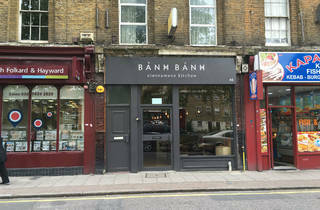 A small Vietnamese eatery in the ever popular area of Peckham Rye. It's pricey for what it is but there are some dishes worth a try. 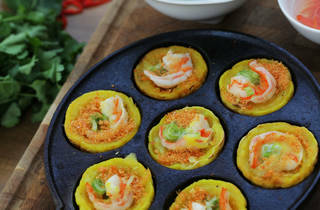 For example, the banh knots - diddy coconut pancakes topped with a prawn - is eaten wrapped in a leafy green and dipped in vinagette. You won't find it in many restaurants. 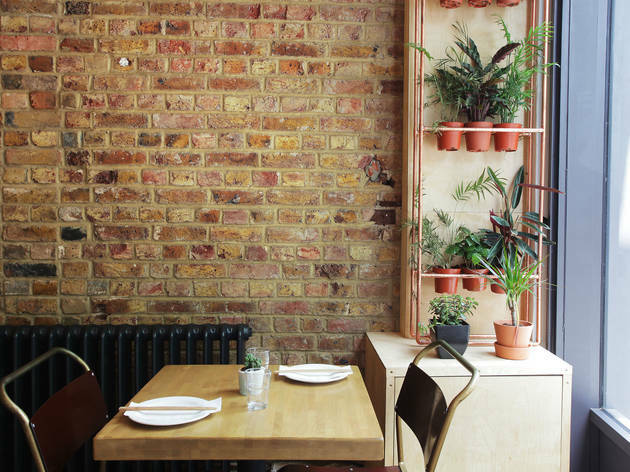 Incredible food, run by a lovely Peckham family! A lot of love went into this food. Foods really fresh and tasty! 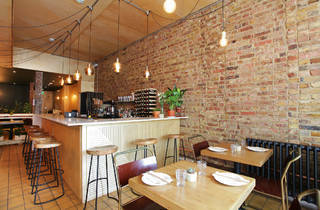 They've really hit the ground running as a new restaurant with great service and a friendly team. Amazing food and friendly atmosphere. 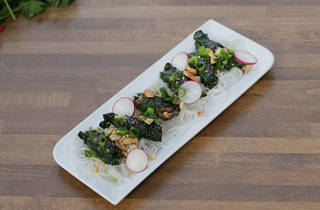 Fresh, creative - but at the same time traditional - food, made and served by a fabulous band of siblings. Great fit out, atmosphere and all round enjoyable. You must eat here. Great food and staff. Loved it. 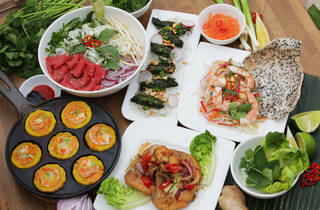 The best Authentic Vietnamese Restaurant in South East London. Easily the best vietnamese food on this side of the river. 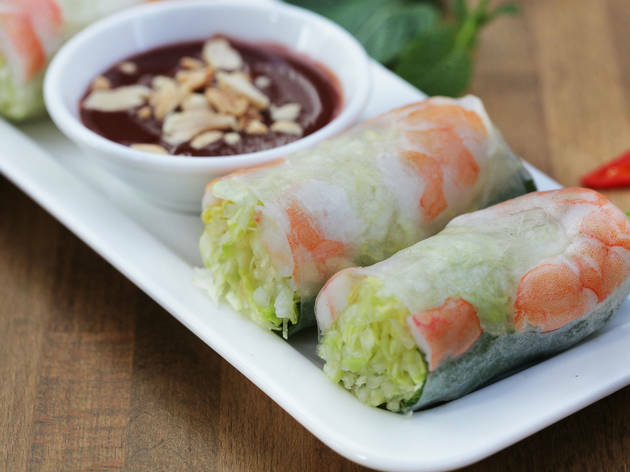 It was recommended to me and I couldn't imagine to have vietnamese anywhere else now. Oi Zoi Oi NGON WAAAAA! It's a sensational experience all round at Bahn Bahn! The warm, fun staff really know their stuff about the whole menu and wine list and the atmosphere was buzzing the night we went. 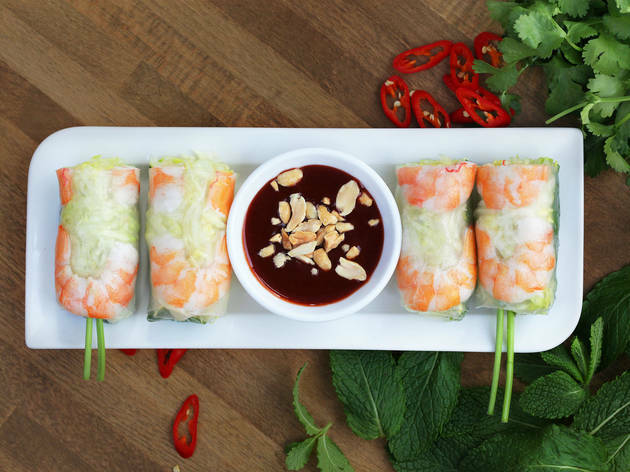 There are comforting classics like fragrant pho and fresh summer rolls, as well as thoughtful variants such as the lip-smackingly good prawn and coconut pancakes - so good we had to order a second round! This is one stylish joint - can't wait to go back! Great little place for vietnamese food, nice atmosphere tasty food! 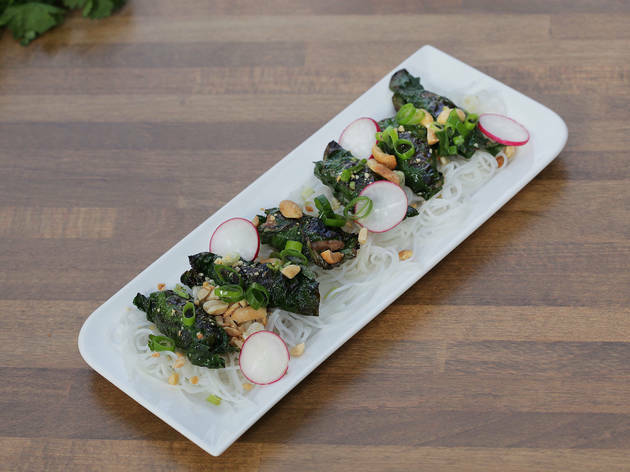 Make sure to try the beef in betal leaf! Fantastic addition to the area! Amazingly addictive food the sticky wings, beef in betal and bo kho stew are not to be missed! Great cocktails and ever greater staff! Great to see a family owned business doing great things. Well worth the trek to Peckham! Our group had a wonderful time at Banh Banh - the perfect setting for a shared meal with friends. 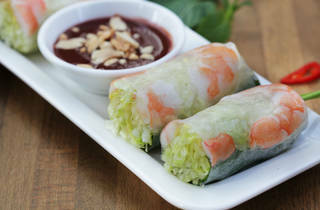 The summer rolls and pho were delicious - simple classics done superbly - you can tell no shortcuts have been taken. We also loved the beef in betel leaves and the sticky chicken wings were so good we ordered seconds! Love and care have gone into every detail - we'll be back! Amazingly deliciously food - they have all the classics and some dishes I'd never tried before! The prawn pancakes and the sticky chicken wings were excellent. It's very well-priced, the atmosphere is super fun, and the staff are lovely. Would highly recommend it to anyone.